It was a tie for the girls Non-Public B team title! 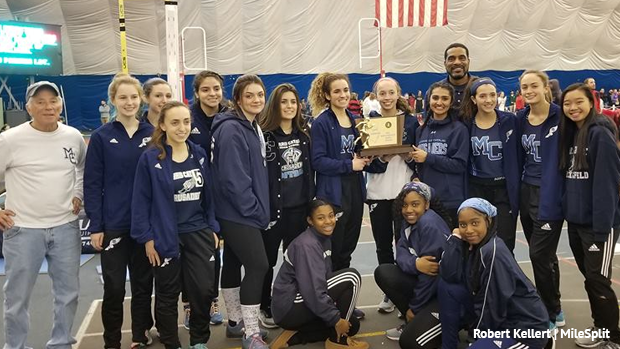 Morris Catholic and St. Dominic Academy fought all the way to the last event and both went home as State Relay NPB Champions. For Morris Catholic this was their first team title since winning three in a row from 1993 to 1995, for St. Dominic this is their second straight after winning their first ever last year. It came down to the 4x400m, St. Dominic Academy was up by two points, Morris Catholic got it done winning the event running 4:18.01. St. Dominic Academy's Milani Bethel came up big making back spots late on her anchor leg to get her team to second place, after the scores were tallied both teams finished with 50 total points. 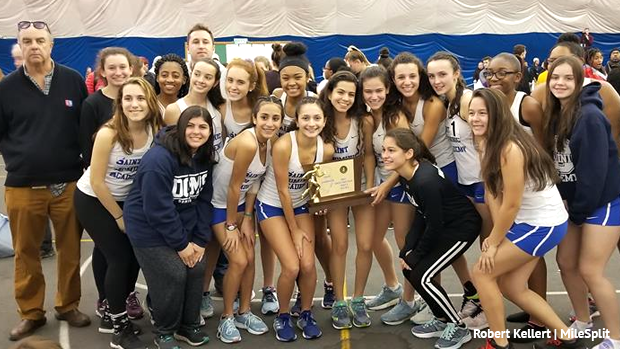 St. Dominic Academy gained 10 points in the field where they won the high jump with 8-08 as a team from Logan Hart's event leading 4-06 and Suhayla Johnson's 4-02. On the track they had five top three finishes including second places in the 4x200m, 1:56.88, 4x400m, 4:22.50, and 4x800m, 10:27.59. Trinity Hall picked up a win in the 4x200m running 1:51.93. Kent Place School took over the 4x800m with a NPB meet record 10:06.37 and won the shuttle hurdles at 37.75. Dwight-Englewood also brought home gold in two events winning the shot put and pole vault relays. India Marseille led the shot at 31-09.25, teammate Adia Guthrie 25-08. In the pole vault Linsey Lam vaulted 7-06 and Allison Tsai 7-00. 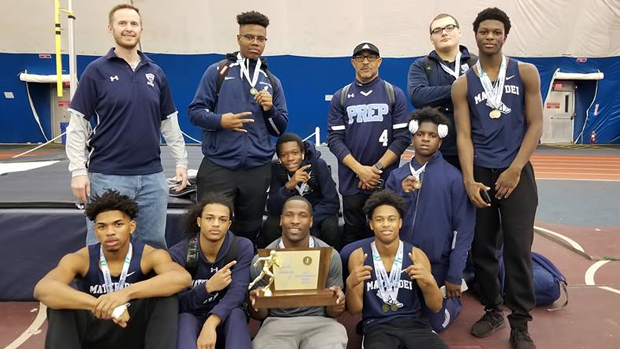 In the boys meet Mater Dei Prep won four of the eight scored events, as no teams cleared in the pole vault. Mater Dei's team championship was a well rounded attack with victories in the 4x200m, 1:34.72, 4x400m, 3:36.01, high jump, 11-00, and shot put, 74-03. Their high jumpers were Narin Buntin, clearing an event leading 5-10, and Patrick Mastro, 5-02. In the shot circle Noah Lawson led the team with a 37-03 but teammate Anthony Perez wasn't far off at 37-00, they were ranked second and third individually. All of this added up to a 46 point victory for Mater Dei making it two straight, they won their first ever State Relay team title last year. St. Rose had two victories on the track winning the distance medley relay, 11:45.13, and shuttle hurdles, 44.26. Dwight-Englewood took home gold in the sprint medley running 3:55.07. The 4x800m went to Immaculata at 9:15.69.